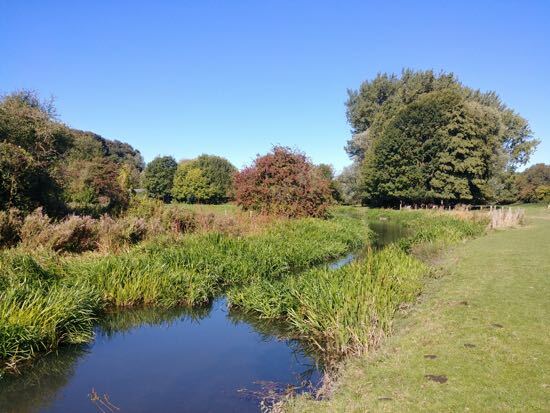 This is a short walk through several fascinating geological areas including an old quarry which is now a nature reserve, marshland alongside a rare chalk-bed river, and deep woodland. It has a fair amount of up and down as you loop across heaths, down to the river, and back up through the woods. 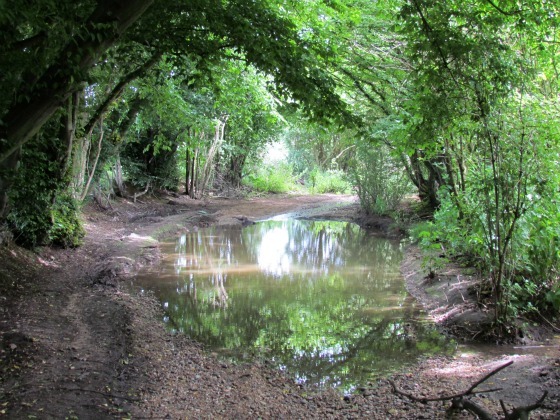 There is a free car park, well-marked paths, but, unusually for this collection of walks, there are no pubs or refreshment stops along the way, so do take water and a snack if you intend to make a day of it. There is an elevated picnic table three quarters of the way round affording great views. Park in the free car park off Vicarage Lane (grid ref: TL 316150, postcode SG14 3LU). 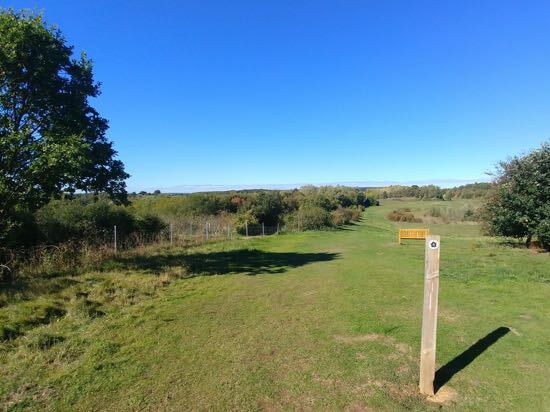 You will notice two paths leading out of the car park, one to the north-east, and the other to the north-west. Before you set off, study the map on the information board. 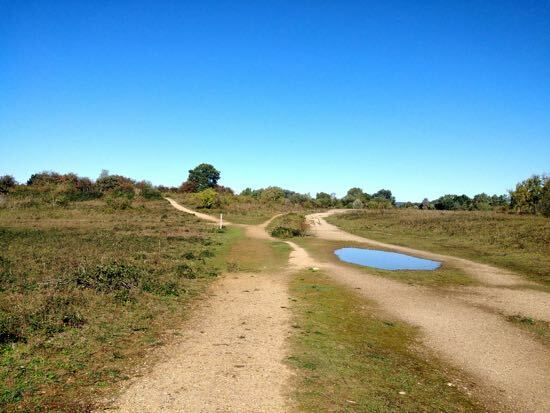 At least half of the walk is within the Herts and Middlesex Wildlife Trusts Waterford Heath reserve. 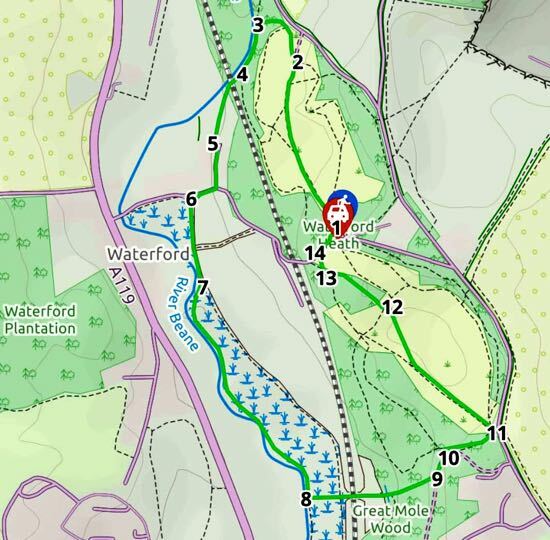 1: Leave the car park in the north-west corner and follow the path through the woods and out to open heath land. This is the North Heath. 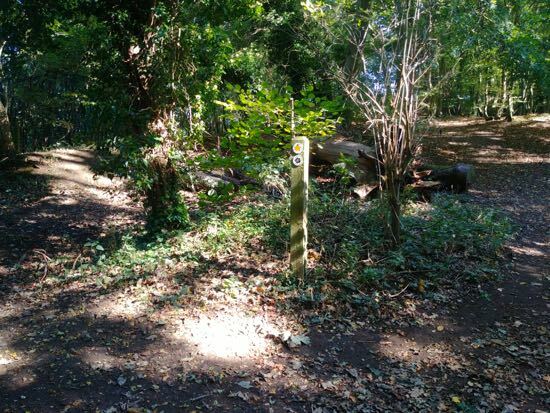 2: You will reach a gate leading to a path on your left with a signpost bearing the black Herts and Middlesex Trust arrow. Go through the gate and head west down to the river. 3: At the bottom of a series of wooden steps you reach a footpath T-junction. There is an information board on the right and a bench on the left. Here you turn left and walk south-west alongside the River Beane. 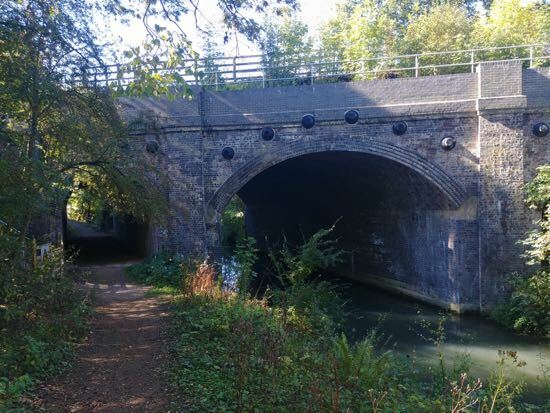 4: Continue walking alongside the river, ignoring a path on your right, and follow the path under the railway bridge. 5: You now cross open ground before emerging on Barley Croft. Continue heading south until you reach Vicarage Lane. Here you turn right and head west a short distance looking out for a path on your left before you reach the River Beane. 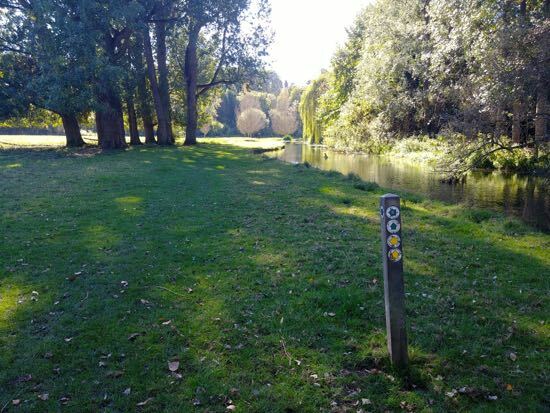 6: Turn left on this path and follow it as it heads south alongside the river. 7: At the point where the path forks, take the right-hand fork keeping close to the river bank. 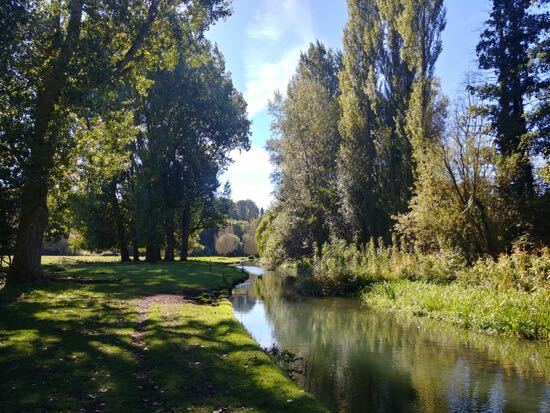 8: Continue until you reach a wooden signpost (see above) at a pretty bend in the river (see top photo). Here you turn left and walk east across the field, under the railway, through a gate, and then up through the woodland. 9: When you reach a footpath T-junction turn left and head north-west a short distance looking out for a marker post with yellow and black arrows. 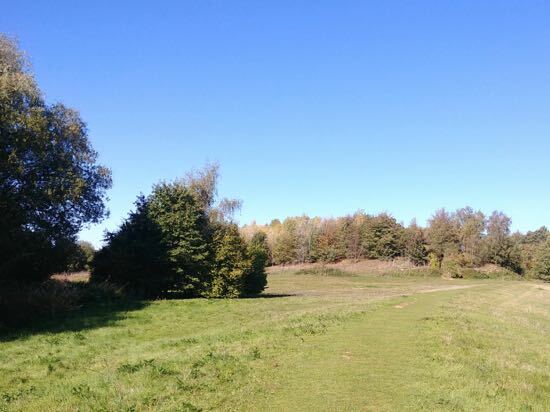 10: Here you turn left and follow the path as it bends round to the right and continues to South Heath. 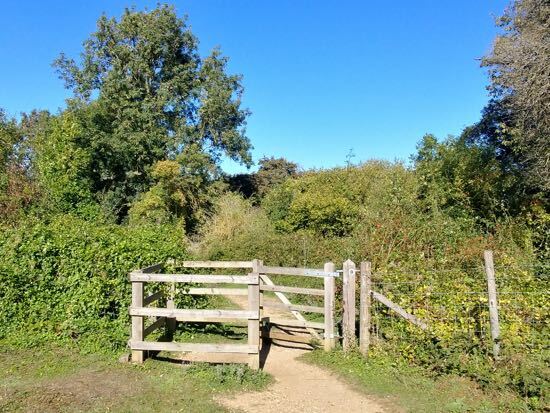 12: At the north-west end of South Heath you will see a path off to your left leading to wooden steps. Take this path, climb the steps, and follow it through the woodland. 13: The path leads to a gate. Go through and continue north-west until you reach a path on your right. 14: Take this path back to the car park alongside Vicarage Lane. Those with smartphones or tablets might want to take advantage of the interactive map below, which also contains KML and GPX data.